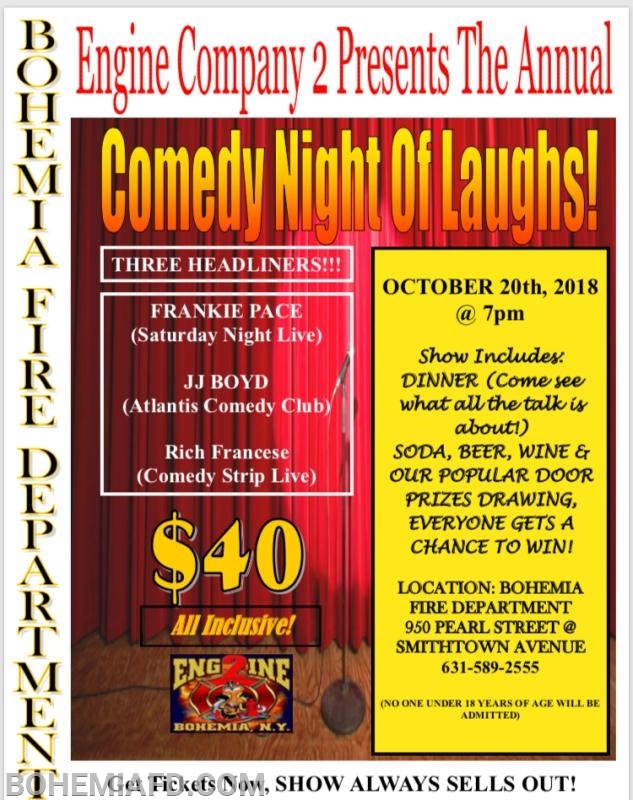 Bohemia Fire Department Engine 14th Annual Comedy Show Fundraiser, Saturday, October 20th. $40 per person admission to show headlined by comedians Frankie Pace, JJ Boyd and Rich Francese, includes our famous steak dinner with soda/beer/wine, and door prizes. Everyone gets a chance to win with door ticket! Show starts at 7pm, doors open at 6pm. Location is Bohemia Fire Department headquarters at 950 Pearl Street. Tickets are available at door and also for pick up Monday-Friday 3pm to 11pm. Contact Captain of Engine 2 Brian Hocker at 631-589-2555 for tickets.